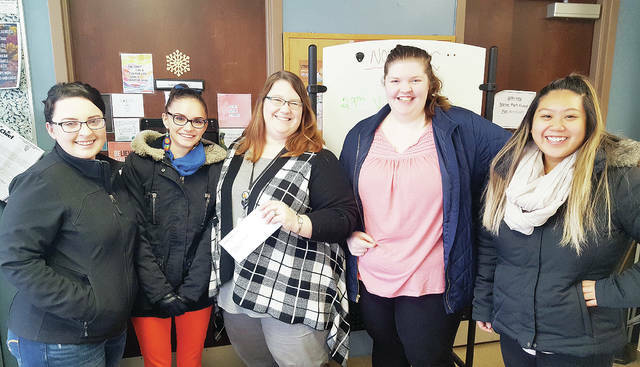 Members of the Student Body Organization at Northwest State Community College in Archbold recently delivered a check for $514 to the Path Center, a social services organization in Defiance. The donation represented proceeds raised at the college’s Chili Cook-Off event in mid-October. Pictured, from left, are Taylor Newman, Izta Galindo, Susan Cheeseman of the PATH Center, Kim Eggebrecht, and Andrea Vankham. https://www.fcnews.org/wp-content/uploads/sites/45/2018/12/web1_NSCC-donation.jpgMembers of the Student Body Organization at Northwest State Community College in Archbold recently delivered a check for $514 to the Path Center, a social services organization in Defiance. The donation represented proceeds raised at the college’s Chili Cook-Off event in mid-October. Pictured, from left, are Taylor Newman, Izta Galindo, Susan Cheeseman of the PATH Center, Kim Eggebrecht, and Andrea Vankham.